The Global Transformation of Time 1870–1950. The book of Vanessa Ogle represents an important historical study on the origins of the uniform time. The profound analysis of original and previously understudied historical sources and reflection on the transformation of the temporalities in various cultures contributes significantly to social and historical research. Even more remarkably, this book tells a new narrative on the creation of the uniform time on a global scale, very different from the dominating one in the scholarship. For several last decades, the historical and social thought on global time followed the reflection of E.P. Thompson on relations between time and discipline. In his classic article Time, Work-Discipline, and Industrial Capitalism of 1967, he suggested that the creation of the uniform time was motivated by the increasing industrialization of society, as the working hours allowed easily to control and synchronize a vast number of workers. The Ogle’s historical study consistently argues with this idea and demonstrates that the uniform time was a result of numerous social and political negotiations shaped by multiple forces, while industrialization process had a minor role. Another significant contribution of Ogle's book is the reflection on the spread of uniform time as a global phenomenon. Ogle shows that paradoxically, diffusion of the uniform time stimulated the spread of a greater variety of times, from religious to local calendars. With the proliferation of the uniform time, the world paradoxically became less homogenous and a more uneven place. The organization of the book is thematic: starting from the issues of the uniform time, the chapters progress to the problem of calendars, traversing from Germany to the Levant. The introduction outlines the key pillars of the theoretical framework. Ogle writes about the increasing interconnectedness of the nineteenth century, which at the same time accompanied the rise of nationalism and powerful state apparatus. She also introduces the reader to the prevailing ideas of the late-nineteenth century, such as the idea of the world turning into a global village, and an obsession to compare nations and social organization. The author emphasizes that the late-nineteenth century discourse about time consists more of “uniform” and “universal” time, rather than of the process of "standardization," than spread in the 1920s and 1930 with the success of Fordism. The first and second chapters explain in a greater detail the context of the nineteenth-century globalizing world and raising interconnectedness through a new-formed network of railways, telegraphs, and steamers. The author focuses on the French and German politics of time unification and different attempts to map the globe into the time zone system, accompanied by rigorous debates on any detail of such a system, from the centralization of time to the exact second of this time. Some ridiculous projects even suggested an hour made of a hundred minutes instead of sixty. The World War I was also the war of times, as French replaced Germany’s Central European Time in the occupied territories with France's meantime one hour slow, and vice versa. The time was also a subject of debates on the Peace Treaty at Versailles in 1919 (p. 45). In particular, the author asserts that the uniformity of time did not rise from the routines of workshop and factory labor because the top-down implementation of any international and national time was slow to affect social behavior. In in some regions of Germany, workers kept leaving for work at 5:30 instead of 6:00 am as if the old 5:30 would always remain the “real” time (p. 37). Even the introduction of the summertime met tough resistance, as it could "disturb the habits of the cow" (qtd. on p.60) or even destroy overlap of working hours in New York and London essential for Stock Exchanges. Moreover, these and other reflections on time brought up arguments about time for leisure and entertainment, then just about work discipline. The third and the fourth chapter tackle a question how the uniform time spread around a globe. The author shows that the “uniform” and “universal” had different meanings in different national and regional political and cultural contexts. In particular, the author describes when the time spread in different parts of the globe, such as in South America and the international sea. The colonies attract the particular attention, as an attempt to organize the world communication was, in fact, the attempt to spread the communication from the European powers to the rest of the world. The colonies often resisted the time prescribed by the empire and the local officials simply failed to comply with the orders. The proliferation of the global time, the author concludes, was extremely uneven. The unevenness of globalization also reveals itself in the case of the Indian Standard Time as a result of “44-Year-Old Battle of Clocks”. Ogle underscores that for inhabitants of many cities, such as Bombay, the plurality of times was a natural rhythm of living. Overall, while highlighting that uniform time indeed helped to intensify migration, economic integration, and political contacts, Ogle emphasizes that even in the absence of the uniform time, the transportation and communication "worked just fine." Last three chapters concern with a different twist on the diffusion of the uniform time: strong collision with the religious time and calendar. The uniform time was perceived as an alien innovation: for instance, there were extensive debates whether it was permissible to base the start or end of Ramadan on the telegraphic time signal. The author underscores that the creation of the "world" time intensified the dispute on the "world" calendar. Both in Islamic and Orthodox worlds, the dispute arose on the religious grounds. In the USA, on the other hand, it was motivated by the purely economic reasons: companies, such as Kodak, used their calendars of thirteen months for accounting purposes and advocated for the homogenous time and calendar. This book covers many topics, undoubtedly important and essential for understanding the time. However, the structure is occasionally quite chaotic which could complicate understanding the study. Moreover, even though the title indicates period up until the 1950s, the book hardly addresses any issues of the national time after the 1920s, such as, for instance, the creation of the speaking clocks. Media networks and time signals, in general, are not presented in the study as an essential factor of the proliferation of the uniform time. Apart from the British case study in chapter 2 and Middle East policy in chapter 5, the book covers only briefly the topic of actual execution of the new time and does not make any difference between time balls, telegraphy, or radiotelegraphy. In particular, this problematizes understanding of the specific implementation of some practices, such as distributing time signals for ships and navigation in 1895 (p.105). Overall, the study represents a crucial and influential work on the creation of the global time, and at the same time raises the necessity for the further research on the spread of time in different regions. In any of the possible directions of the future research, from the media networks to particular national studies, this study would be an important departure point that provides a necessary framework for understanding the processes of globalization and spread of the uniform time. 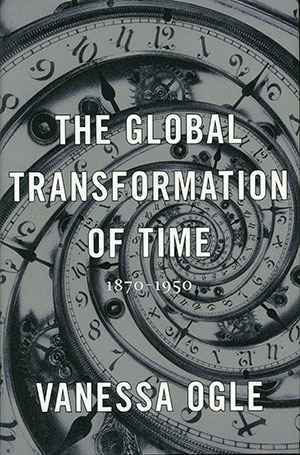 Maria Rikitianskaia: Rezension zu: Ogle, Vanessa: The Global Transformation of Time 1870–1950. Cambridge, MA 2015 , in: Connections. A Journal for Historians and Area Specialists, 12.10.2018, <www.connections.clio-online.net/publicationreview/id/rezbuecher-24834>.